Ummagalli is one of the gems made by my maternal grandmother. Apparently she reminded Amma (my mom) the other day that this used be one of my favorites as a young child. When I called Amma last morning she mentioned to me that Ummagalli is something which I had forgotten for so many years and that it used to be my favorite. There are so many fond memories attached to Ummagalli. How could I ever forget it? I wonder..On so many summer nights, I used to pester my grandma to make this for me and like all grandmas, she always obliged much to my delight. In fact I think it was a favorite amongst all the kiddo gang at that time. So I had to make it today so my family could appreciate my taste :) Thanks to my Grandma and Amma I finally got to renew my taste buds .. This dish is therefore dedicated to both of them. 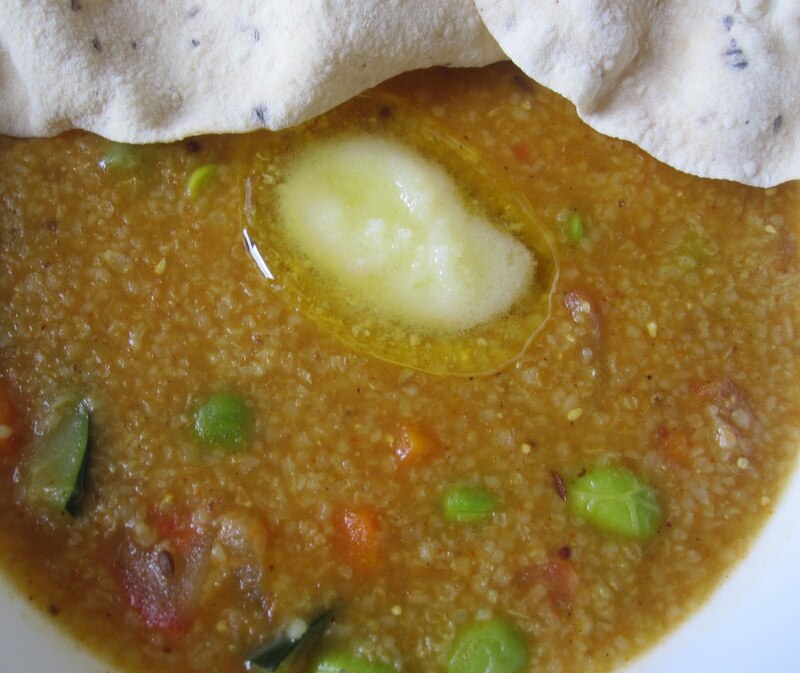 Ummagalli is traditionally prepared with Broken rice (Nookalu) with no veggies. But it can also be prepared with cracked wheat. And to add my own twist to it, I added some veggies. Today I prepared it with cracked wheat and I didn't even get a second serve... Needless to say this will always remain as one of my favorites. Ummagalli therefore goes to the Mother Day's Event hosted by Jyoti of Panch pakwan. In a sauce pan , boil 4 cups of water and add the cracked wheat and let it cook for 8-9 min. It should be cooked and runny. If it is not runny water can be added. In a separat skillet, add the seasoning and after the mustard seeds splutter, add turmeric and tomatoes and saute them until they are soft. Meanwhile boil the rest of the veggies separately or in the same sauce pan as the tomatoes. I boiled them in a microwave separately. After the tomatoes are cooked and mushy, add the rest of the boiled veggies and tamarind juice, Sambar Powder (I used MTR brand), Vangibath Powder, Sugar and Salt. Mix them well and keep stirring it for 4-5 min letting all the flavors to intermingle. The final product is a yummy tasting Ummagalli. It is traditionally a little runny suitable for old and young alike. Serve this with Ghee and Papads for a delicious evening supper or a filling evening snack. Note - Instead of Sambar Powder / Vangibath Powder, Bisibela Bath Powder can also be used..Shall post the recipe for that soon..
Wat a healthy dish, name sounds very new and interesting..
never heard of this recipe. looks delicious. If you don't add vegetables, would that taste like gojju ? And should it be of sambhar rice consistency? Thanks everybody..and thanks to my grandma and amma that this recipe has resurfaced in our kitchen. @Suma - If there r no veggies, then it is usually runny and in the typical besibela bath consistency. Superb taste! thanks for posting!